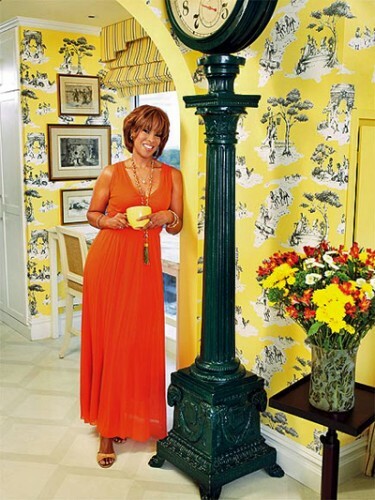 A Delaware reader has asked for help identifying the yellow toile wallpaper in GAYLE KING’S New York apartment featured in People last week. Being the design junkie that I am I recognized the wallpaper right away. HARLEM TOILE de JOUY was designed by SHEILA BRIDGES and created when Sheila couldn’t find a traditional toile that she loved. Sheila’s hand-screened version is a satirical depiction of African American life and is available in several color ways and in beautiful bedding too. Harlem Toile de Jouy can be purchased here.